Pittsfield's Congregational Church thanks Matthew Odell for providing an outstanding recital for the community on Saturday, April 21. People from Pittsfield and the surrounding communities were treated to Matthew's wonderful talent and his insight into the music he played. The Pittsfield Food Pantry and Josiah Carpenter Library are the beneficiaries of the audience's monetary donations. Please mark your calendars for the annual Patriotic Concert at the Congregational Church on June 15, 2018. On Thursday May 17th at 3:30pm the library will host a poetry reading to commemorate the publication of Pittsfield’s very own Maureen Van Horn’s poetry volume Fly Falls in Milk Jug: News in Haiku. The reading will feature Maureen’s work; in addition local poets are invited to attend and read their poems. Please come and savor this special event. The Teen Book Worms will gather on Monday 7th at 5:00pm; they will enjoy a light supper and discuss Their Fractured Light by Amie Kaufman and Meagan Spooner. The Pittsfield Writer’s Circle will meet at the library on Monday 21st at 5:00pm. 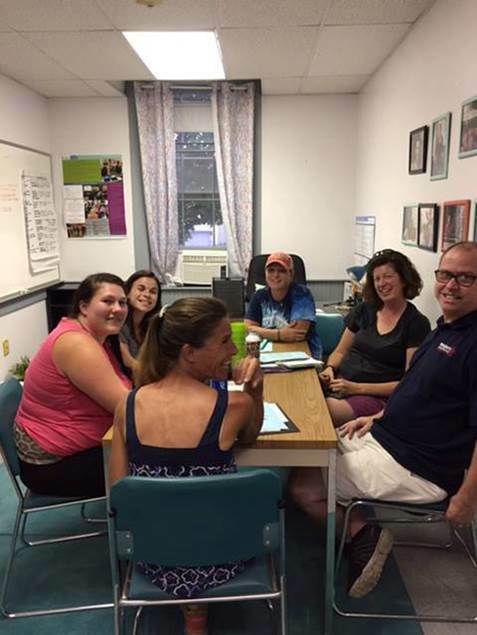 The adult book club will meet to discuss Bottom of the 33rd: Hope, Redemption and Baseball’s Longest Game by Dan Barry at 10:30 am on Tuesday May 22nd at the Pittsfield Senior Center. Everyone is welcome to join our ongoing activities whenever you have the time and inclination. The preschool story hour that meets at 10:00am on Thursday will continue having fun with transportation, and then begin learning about farm animals. The afterschool Adventure Club meets at 3:30pm on Tuesdays and will explore papier Mache, canvas and frame art. On Tuesday mornings at 10:00am we offer a Stay and Play time for toddlers and their parents/caregivers to meet for a brief story, simple games, movement and time to socialize. On Monday May 14th at the Chichester-Epsom-Pittsfield Libraries Memory Café we will explore items from the past and figure out what is it? The Café will begin at 2:00pm at the Epsom Public Library. Local caregivers and folks living with memory loss are invited to come and enjoy socialization in a comfortable setting. Refreshments will be served. The Pittsfield Middle High School Art department has brought a new selection of student art work to display. Please stop in to admire the students’ talent. The cows charged down the hill lining up along the gate in anticipation as the white delivery truck pulled into the barnyard. The chickens joined them, and all waited for the doors to open and scatter treats out on the ground. Twice weekly we pick up five to six barrels of discarded food from Shaw's in Gilford. Most are items that have passed their “sell by date” or are trimmings from fruit. Shaw's has taken a proactive approach to recycling … they put the fresh vegetables and fruit into barrels we provide. 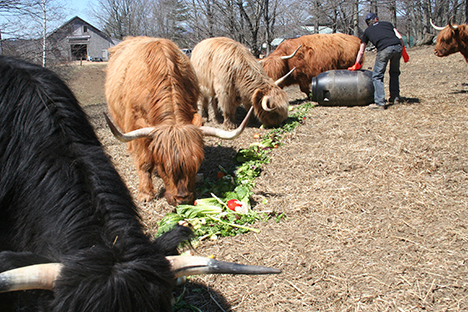 We collect these edible scraps to bring back to the farm and serve to our cattle. Occasionally the pigs are offered cream cheese or butter. We never take meat, and the fruit and vegetables we get are fresh and crisp. While the dates on packages are expired, the food is not. These barrels save approximately $56 in hay (one large round bale) each week, and the cows love the variety of their contents. Imagine if you ate cereal all Winter, that would be like a cow eating hay. Then imagine being served fruit twice a week. The cows love the diversity, and that is why they come running when the truck drives up. Chickens get in the act by picking through the scraps for berries. As Summer creeps upon us, we'll be increasing trips to Shaw's because more people buy fruit and veggies in warmer weather. Not only do we get scraps from Shaw's but several times a week Grappone Conference Center gives the farm bucket of kitchen scraps; food that has never been served and is refrigerated. Great North Aleworks in Manchester also gives us three barrels each week of spent grains which is a by-product of making beer. Our pigs get a tasty meal of the utilized beer grains mixed with pig food. Just like the Conference Center, we like to keep our livestock menus attractive and delicious! It is finally warm enough for the six surviving piglets to move from our porch and back to the pig house. Their mom is fully recovered and is now living with the big pigs. Thanks to everyone who offered to help feed them. I'll be in touch with details now that these squealing bundles of joy have moved off the porch. They still need bottle feeding until they learn how to eat solid food. The calf count is at eight with five more expected soon. All the calves are doing well, even the little guy born in the ravine during the storm two weeks ago who still is without a name. Stop by the farm on Saturdays to check out piglets and calves. It'll be fun to see the six pig babies grow into 300-pound hogs. Soon they'll be eating spent grains, but for now, their diet is milk...lots of milk …and without a mom to care for them they need to eat four times a day. Oink! In Carl Anderson's letters about what he thinks are important things that happened in selectmen's meetings, he omitted some things that I think are important. Carl omitted to say that one of the board of selectmen's first zoning decisions, last December, was appealed to the zoning board of adjustment (ZBA) and that the selectmen lost. Carl omitted to say that he led the selectmen's defense in that case. Carl omitted to say that the selectmen went into nonpublic session to make a complaint to the ZBA about me as ZBA secretary. The selectmen used the "public employee" excuse to go nonpublic when the selectmen all knew that I am an unpaid volunteer for the ZBA and that I am not a public employee. Carl omitted to say that the ZBA rejected the selectmen's complaint entirely. But Carl did say that (after these accomplishments) the selectmen appointed him alone as the new zoning administrator. When the board of selectmen appointed such an opponent of zoning to be the zoning administrator, the selectmen attacked zoning. When the board of selectmen appointed a board member to be the zoning administrator but complained that the planning board should not have a board member as secretary, the selectmen contradicted themselves. And when the selectmen misused a nonpublic session to complain about me, the selectmen were contemptuous of transparency. It has come to my attention that the Pittsfield Select Board has ordered the Police Chief to close the police station for 20 hours a week. Further, the Chief has been forbidden by the Board to disclose the hours during which there will be no police service in town. And there will be no police service because the Sheriff's Department and the State Police have informed Pittsfield that they cannot guarantee any response because of their own short staffing problems. There will not be any mutual aid from surrounding towns as this must be requested by Pittsfield on a case-by-case basis, and this cannot occur when the police station is closed. I believe Pittsfield people have a right to know when the town has ceased providing police coverage, and intend to find out under the provisions of the state's Right to Know laws. I encourage others to do the same. What is an occupational therapist, you say? Do I need one if I don’t work? Don’t let the term fool you. Occupational therapists do amazing work for people young and old, employed or retired, male or female. It is all about managing activities of daily living and helping folks achieve or regain the skill sets that allow them to be independent. Often there is confusion between occupational and physical therapy. While there is some crossover, a good adage is that “Physical Therapy gets you where you need to go - Occupational Therapy shows you what to do when you get there.” OTs enable people of all ages to live life to its fullest by helping them regain their function or teach them ways to improve their independence and live better with injury, illness or disability. Today we celebrate our Occupational Therapists and applaud the work they do to improve people’s lives every day. Common occupational therapy interventions include performing on-site assessments of both the home environment and work environment, making recommendations to appropriately adapt those environments, helping children with disabilities to participate fully in school and social situations, training people recovering from injury to regain skills, and providing supports for older adults experiencing physical and cognitive changes. For example, after a total hip replacement an OT would help a person to relearn bathing, dressing and meal prep independently and safely. Or after a stroke, an OT might work with someone who lost the function of one arm to discover new ways to dress or cut up vegetables with only one hand, perhaps with the use of some adaptive equipment. Even a patient who struggles with COPD can learn some coping strategies like to sit while brushing teeth or keep commonly used items closer at hand. Central New Hampshire VNA and Hospice has many qualified and friendly Occupational Therapists who can help you after an accident, injury or illness. If you have experienced any of these or are facing surgery, call 1-800-224-8549 to learn more. Well, just when you finish a big project like the Scenic Theatre Sprinkler System installation, another project crops up. And of course the latest project takes precedence over all of our others, because it seems squirrels (oh, and birds) have made their way into the soffit at the very tippy top of the back of the theatre. They appear to be contained in that area, and have not, so far, made their way into the building, but this issue has to be addressed right away. But how do we get up to the very tippy top of the rear of the building? Because of our storage shed, a simple solution such as putting up a ladder is impossible. It’s got to be done by someone with lots of scaffolding to reach that high, or with a really tall bucket lift. And once you get up there, you have to have carpentry skills in order to fix the situation. 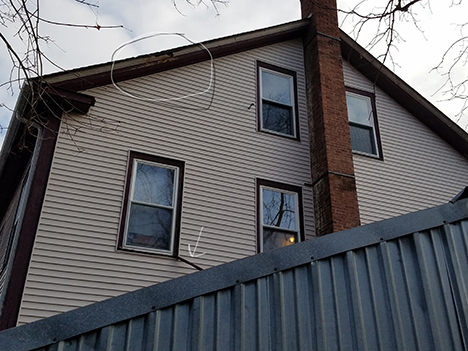 Our guess is that the job will probably entail a whole lot more than just the one circled area of the trim boards, and we also know that the wooden window frames need work as well, as you can see from the arrow in the photo. So if you are in the construction business, or know someone who is in that line of work, and who has the equipment to reach that area, we’re looking for someone who can do the job. To give us a bid or to put us in touch with someone who can do the job, contact maye@pittsfieldplayers.com. We’d like to get this done over the summer, before next winter. Can you help us??? Long agenda with numerous approvals and denials of tax abatements, veterans credits, timber tax, sewer user fees, etc. 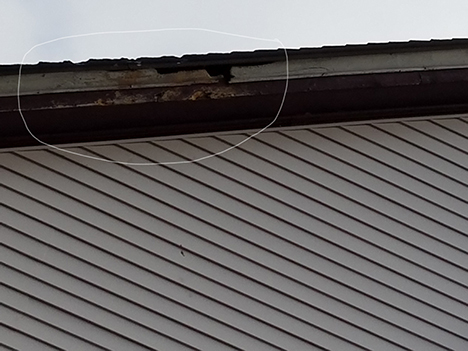 Discussion relative to the library chimney condition and how much repair it actually requires. The building inspector and fire chief will assess this need. Joshua Stevens was hired as a full time police officer. He is presently part-time accredited and will attend the full time academy this fall. Also in police staffing talks, the projected shortfall of approx. $30,000 was discussed, and frankly agonized over. Due to several officers resigning after Town Meeting (where the total PD budget was established by voters) 24/7 coverage at overtime and outside detail rates has become unsustainable. This temporary situation has tapped all known sources of revenue we are at liberty to use and the BOS reluctantly but unanimously felt the only solution is to cut police coverage from 168 hrs per week to 148 hrs for a two week trial period. Chief Cain was given the latitude to decide when to exercise this directive with the explicit condition that times be random, unannounced, and variable so as not to be predictable. Response times during these limited hours may be adversely affected, however, until a better solution is found, we need to take action so we don't run completely out of money at an even worse time. A zoning compliance question relative to a proposed use of the convent on Fairview, which is for sale, was discussed. The proposal is for a drug rehabilition group treatment facility with up to 70 or more beds. The Pittsfield Area Senior Center is welcoming Spring, with a number of different activities and events thru the month of May. Everyone is invited, no matter what your age is, to participate in the activities. The center is having their annual Meals on Wheels fundraiser, an ethnic cooking demo, entertainment, and a planting party. On Thursday, May 3, from 9:00 am to 12:00 pm, the center is having their annual Meals on Wheels Bake Sale Fundraiser. One in six of our senior’s nationwide struggle with hunger and the Meals on Wheels programs help prevent this. The program helps seniors stay in their home longer and help the participants to feel more secure and safe. Visit the center at 74 Main St. in Pittsfield, buy some tasty homemade treats, and support our seniors that are in need. Tuesday, May 8, at 10:30 am there will be a taste testing cooking demo, Southwest Fiesta “Cooking Around the World.” Maggie Perez is a certified Health and Wellness Coach, while she is cooking you can learn about the health benefits of the foods being cooked, then you will get to try the food. The menu is Black Bean Burritos, Mexican Rice, and Virgin Strawberry Margaritas. This class welcomes everyone, please call the center by May 7, at 603-435-8482 if planning to participate. Thursday, May 10, from 11:30 am to 12:30 pm, there will be a Mother’s Day Luncheon. Don Smith will be performing thru the celebration. Don plays at many local venues and is very entertaining. He plays his guitar and sings music from many artists including Johnny Cash. So come in enjoy the entertainment, while celebrating our Moms. Please RSVP by May 3, if planning on attending. Tuesday, May 15, at 12:00 pm a retired UNH professor in horticulture, is coming to the center to help us with container gardening and give us tips on our home gardens. A lifelong love of gardening should not have to end as mobility and other issues arise as we age. Container gardening can be an easy way to have beautiful flowers or a few fresh fruit and vegetables without all the bending. You can do container gardening no matter what amount of space you have. This class is free and open to the public. Please call 435-8482 by May 11, so supplies can be planned accordingly. Mrs. Shirley Bleckmann, 89, of Boscawen, formerly of Pittsfield, passed away peacefully, surrounded by family on Saturday, April 14, 2018. Born on August 7, 1928 in Kalamazoo, MI, she was the daughter of the late Rudolph and Hettie Woodward Smith. Shirley moved from Kalamazoo, MI, to Pittsfield, NH when she was in high school and remained there, where she raised her family and fostered great friendships. Shirley was deeply involved with the First Congregational Church in Pittsfield, where she served as a Sunday School Teacher, was a member of the Dorcas Guild, directed the Flower Committee, and volunteered countless hours. Shirley was voted "New Hampshire Mom" in 1992 and participated in the "Mom USA" finals in Lexington, KY, placing 5th in the nation. She enjoyed flower gardening, listening to the birds, and collecting miniature teapots. She had an avid sweet tooth for chocolate and was always well-supplied. Besides her parents, she is predeceased by her husbands, Kurt Bleckmann, William Robinson, and Albert Riel; her son, Terry Robinson, and her brother, Paul Smith. She is survived by her daughters, Peggy Reardon and her husband David of Gloucester, MA, and Jodi Alexander of Concord; her son, Douglas Robinson and life partner Victor Perea of San Diego, CA; daughter-in-law Denise Robinson of Epsom, NH; daughter-in-law Susan Bleckmann of Pittsfield, NH; her grandchildren Caleb and Eli Alexander, Kyle Reardon, Heidi Reardon, Amanda Orfanos, Christopher Johnson, Amy Thompson, Karen Kharitonov, Frederick Bleckmann, and Kathy Bleckmann; sisters, Ann Hoar and Peggy Weldon, both of Boscawen, several great grandchildren and numerous nieces, nephews and cousins.